Apparently the cool thing to do in my apartment is take a beer bottle cap and pop it into my pretty potpourri in a vase in the kitchen. Now there’s this awkward metal layer on top of my attempt of domestic goodiness, so I figured I might as well see if there’s another use for these cramping-my-style bottle caps. Maybe Miller (or another read: better beer) will pull through with another promotion like the 2008 summer bottle cap drive. Every Miller Lite bottle cap mailed in during its “Better. Bolder. Summer.” promotion turned into a ten-cent donation for MDA. A summer’s worth of beer caps could be a small fortune, but Miller donated its max amount of $100,000. One of my favorite skin & hair care lines (AVEDA) acknowledged the number of plastic caps filling landfills, in turn creating an ongoing nationwide bottle cap drive with schools. Rumor has it you can donate at any retail location as well. 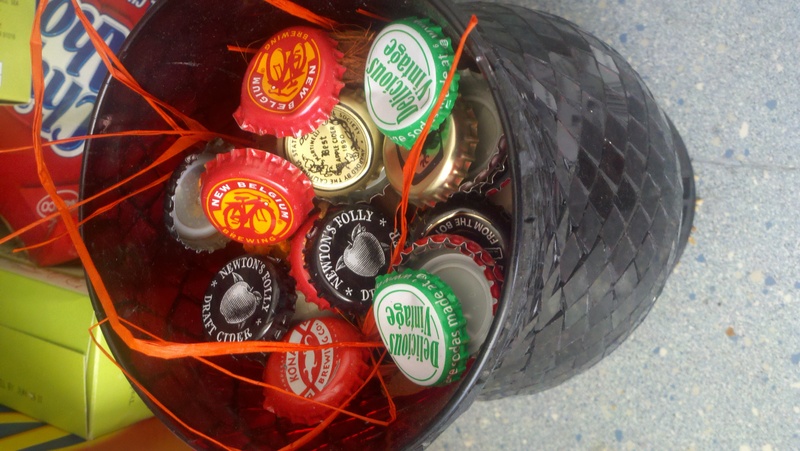 Make your fridge wear its heart (errr… insides) in its sleeve by making up some bottle cap magnets. Give your jewelry family a more eclectic cousin with these bottle cap pendants. If you won the mock elections for “most patient” and “most artistic”, well do I have the project for you. 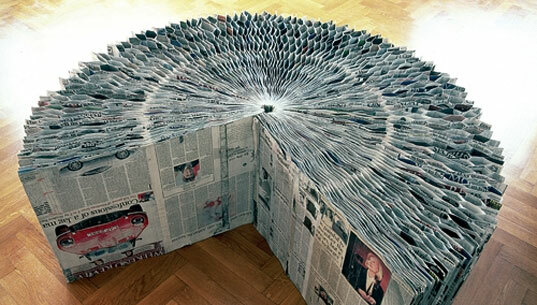 The extravagant bottle cap art in this WebUrbanist piece will blow your flipping mind. 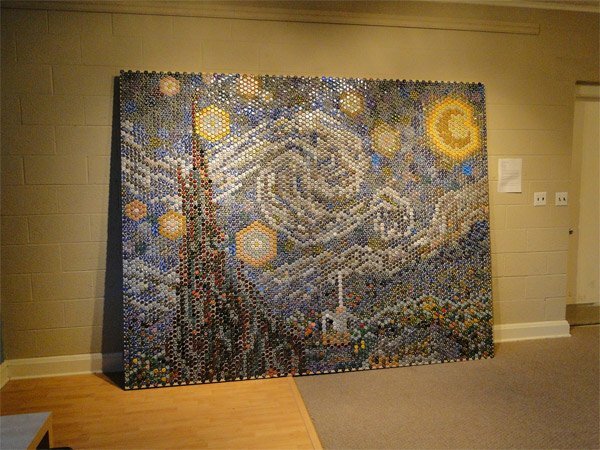 We’re talking full-on recreating of Starry Night using the cap to your last drink. Any other uses, beverage-swigging friends? I’m sure not many of my readers have instant access to billboards, but a recent article on GOOD highlighting a company that repurposes billboard signage into place mats as the inspiration to see how else they’re being reused. One company really harps on the reuse of billboard signage as tarps. Like Dave Letterman, they even provide a top ten list of ways you can reuse a billboard as a tarp. From the pool to a chicken coop, those old ads can really come in handy. The Society of Environmental Graphic Design hosts information about a pretty sweet concept where earthbags are erected by using billboard vinyl as the prominent building material. Sustainability FTW! If you’re the actual business (or maybe a big fan) who had the billboard, consider reusing it at trade shows or even (if you have enough space), showing it off in the office. Raise your hand if you have one of the following in your possession: a vaseful of pretty flowers, some chocolate goodness in a heart-shaped box, something shiny and blingy or something remotely resembling the most overhyped holiday of sorts (sorry, personal bias). Yes, lovers everywhere raided their local department stores Sunday night to make sure that somebody special in their life had a token of love on Monday. Some of the most common gifts tend to go forgotten in hours, so why not make the most of your recent inheritance? Want to brighten somebody’s day? Give your pretty petals to your local hospital, hospice or senior home. If you happen to receive an abundance of flowers (or if you have a large-scale event, wedding, etc. in the future), organizations like Second Bloom, Flower Power and The Forget Me Not Foundation handle the donation to final destination work for you. No use for the vase afterward? Fill it up with artificial flowers and donate to one of the said causes mentioned above for permanent prettiness year-round. There are SO MANY great uses for roses (besides just looking pretty). Some of my favorites include making a rose petal potpourri, eating a special treat of candied rose petals, creating your own rose petal paper or throwing together a few homemade drink coasters with pressed flowers. Keep the romance alive. Scatter some rose petals anywhere and everywhere… in a running bath, on the table before dinner, along the bed, (insert other random locations that make sense to you here). It’s the gift that keeps on giving AFTER Valentine’s Day. Vases tend to be super handy and completely underused. Give a second life to your flower holders by giving them a new job. Depending on the size/shape of the vase, you can repurpose them as anything from a new candle holder or decorative piece (fill with marbles/that lovely rose potpourri) to a fish bowl or serving dishes. Know somebody hosting a big event soon? See if they’re open to collecting vases to use at their shindig instead of investing in a ton. Works great at bridal or baby showers, as the centerpieces are usually given away as prizes, so no attendee will go home with the same gift. Back to flowers.. the ones you’ve surely forgotten about by now. If your petals are on the verge of dying, there’s a chance you can still make a rustic type of arrangement. Moving on to the more delicious option… a box of chocolates. Maybe you’re holding onto that New Year’s resolution still and are avoiding sugary treats. Good for you, and good for the ways other can benefit from it. I can’t believe I found organizations that take candy donations, but bingo! Two international organizations that openly take candy donations include Ronald McDonald House Charities (helping families with children undergoing medical treatments) and Operation Shoebox (care packs for the troops), according to this WSJ article. If you’re looking to give locally, some organizations who provide meals (soup kitchens, Meals On Wheels, etc.) may be open to taking sweet treats in. Make sure ALL donations are unopened/unwrapped. You know how there’s always those chocolate-coated flavors you can’t stand eating? Or maybe you’re not enough of a chocoholic to down two pounds of the goods. Solution: chop up and freeze the ones you don’t eat. You can pull those goodies out to add to hot chocolate, ice cream sundaes, coffee-based drinks or any baked goods. Be sure to separate and properly label the treats if you have lots of flavors on hand. Those boxes… so cute, right? Apparently lots of people agree because we found lots of popular reuses for the packaging. 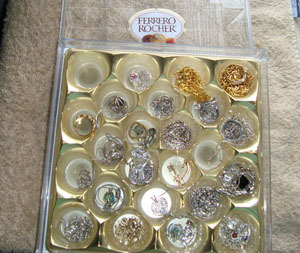 Use them as a jewerly holder, makeshift coin bank or random items (sewing materials, love letters, etc.) holder. Or make this lovely heart-shaped clock with your former candy-toting container. Spare key holder. A distinctive holder for those back-up keys. At least if you misplace your main set, you should be able to find the spares. Seed storage. Keep your most treasured plant seeds boxed up and safe before planting come spring. Wedding vows/special love letter holder. Adorable way to keep those special words on paper safe.